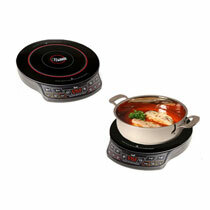 The NuWave PIC is a precision induction cooktop for the same makers that brought you popular the NuWave Oven. The PIC is a portable and versatile cooktop that can prepare meals faster while saving energy. It is designed to heat a rapidly and can boil water in just 90 seconds. You and your family can enjoy a healthy and delicious home cooked meal even when pressed on time. You’ll be able prepare a variety of meals much faster than before. You can use it for boiling, steaming, simmering, deep frying, stir frying, grilling, barbecuing, sauteing, steaming, and more. Not only does it cook faster but it also extremely energy efficient. The NuWave PIC uses from 70% to up to 90% less energy than an ordinary gas stove or electric stove with it’s eco-friendly design. The PIC gives you precise temperature controls not found on other cooktops. The temperature can be adjusted from 100 degrees to 575 degrees in 10 degree increments. There’s also 6 presets available for common cooking needs and timer settings. Another useful feature is Programmable Stage Cooking, which you can save and recall for later. This lets you set the NuWave PIC to cook at different temperatures for a certain length of time automatically. You no longer have to watch the pot. Plus the NuWave PIC is also one of the safest cooktops available. It uses induction technology to cook so there are no flames and no fire risk. Also the induction technology only transfers heat to the pan while the rest of the cooktop remains cool to touch. The NuWave PIC sells for 3 payments of $33.33 plus shipping and handling. It comes with a Carrying Case, Quick Start Cooking Guide, Complete Cookbook, and Instructional Gourmet DVD. You can also take advantage of buy 1 get 1 free offer and get a second NuWave PIC for free by paying the additional shipping for it. You can also add additional bonuses to your order with the free NuWave PIC Cooking Package by paying another additional shipping and handling charge. It includes a 3.5 qt Stainless Steel Pot with Lid, a 9″ PerfectGreen Omelet Pan, a 10.5″ PerfectGreen Fry Pan, a Stainless Steel Steamer Basket, and a 9 Piece Deluxe Fondue Kit.